IsraelFest returned to campus Tuesday afternoon for its annual exhibition of Israeli food, history and culture. 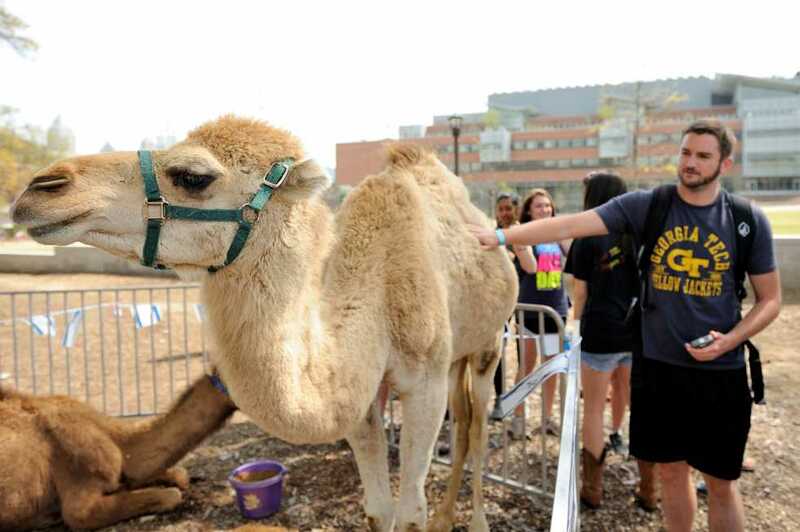 This year’s event brought the ever-popular falafel dish and camels to the center of campus. The event was hosted by GT Hillel, a student-run campus organization that provides religious, social, community service and Israel Advocacy programs. First-year ME major and vice-president of Israel Programming with GT Hillel, Isaac Wittenstein, organized IsraelFest this year. He emphasized the balance of information available to attendees that featured the technical advances being made in Israel with the traditions of its ancient origins. “Because [Tech is] mainly a technology-centric institute, we wanted to bring in someone from the Israel-based company Given Imaging to showcase their PillCam and some other really interesting enterprises, while still integrating the liberal arts side by educating students on the history,” Wittenstein said. Lior Koren, a fourth-year IE major, is the president of GT Hillel. Having joined GT Hillel during her freshman year at Tech, she has watched IsraelFest grow over the past several years. “We’ve always had the camels, but since I was a freshman we’ve started bringing in different companies that work in Israel to present their new technologies, we’ve revamped almost all of our displays and we’ve added more interactive activities like giveaways and photos,” Koren said. GT Hillel’s goal for the event was to bring a broad representation of Israeli and Jewish culture to Tech, with a special focus on the secular aspects of the culture, while educating students on some of the educational opportunities available to them. Adam Klein, the student life coordinator of GT Hillel, attended IsraelFest and showed students how to write the phonetic pronunciation of their names in Hebrew. Klein learned Hebrew growing up in the Jewish prayer services attended by his family, which included readings and rites involving the religious texts of the Torah. Klein encouraged people to learn the language, expand their perspective and engage with speakers as an opportunity to learn something new, because has many uses in modern society. “Hebrew is the language of Israel, and for anyone who might be interested in traveling there, it’s valuable to learn it for that reason. It’s also the original language of the biblical text, and people who want to look at the biblical writings without having to rely on translated versions would benefit from knowing Hebrew,” Klein said. “Additionally I would say that it’s fun to learn, and as a Semitic language that has a lot of differences from the Germanic languages that we’re more familiar with here. Even learning simple things like points that are used as vowels, how a word strings together and the right-to-left aspect that is shared in languages like Arabic, can be useful,” Klein said. Noga Halevi, who has lived in Israel her entire life, came to the event as an emissary representing the large non-profit organization Jewish Agency for Israel. She found IsraelFest a great chance to give others a deeper understanding the country. “I think it’s a great opportunity to bring Israel to everyone and not just the people who go on a daily basis to the Hillel or a synagogue. It shows people what Israel is really about, which includes our popular camels but also a really rich history and culture,” said. For some who have visited Israel, the experience was an enlightening one that inspired many observations about the historical wealth of the country. “My first experience was a religious trip with my family and synagogue, and my second was the Birthright program that I went on with GT Hillel. It was amazing to actually see so many of the things that I had been studying, and when you’re there it’s mind-blowing to realize that compared to the historic American buildings you might find in New England that were built 150 years ago, but some of the buildings there are 500 and 1500 years old. Those places bring the biblical ideas that we read about to life, which is incredible,” said Aaron Goldman, an eighth-year doctoral candidate in EE. Hillel is the world’s largest international Foundation for Jewish Campus Life, and gives students attending more than 550 colleges and universities opportunities to explore and celebrate the Jewish culture through a global network of student leaders, professionals and lay leaders. Tech’s Hillel chapter offers events throughout the year, such as weekly Tuesday Bagel Breaks with guest speakers, and their up-and-coming Challah for Hunger food drives. For this year’s IsraelFest, Koren and Wittenstein hope that students who attended the event took away from it how much Israel has grown into a diverse technological and economic hub on the world stage. “We want to have a day each year where students who don’t know much about Israel can ask questions to representatives who have been there and understand why it’s so important that the country exists,” Koren said.